The content from these proceedings comes from a symposium honoring Larry Hench, a pioneer in the field of bioceramics. Prof. Hench has condensed his Sosman Lecture into the keynote paper of this volume. In addition, this proceedings draws together research in the different aspects of bioceramics and illustrates its unifying themes. Apatites and active bone substitute materials are well represented, with extended analyses of processing effects and variations in making these materials more functional. Included in this volume are a series of papers on interactions between ceramics and biological environments with some much needed analysis of why ceramics succeed or don't in vivo. Proceedings of a symposium to honor Larry Hench at the 105th annual meeting of The American Ceramic Society, April 27-30, 2003, in Nashville, Tennessee; Ceramic Transactions, Volume 147. Veeraraghavan Sundar is the editor of Bioceramics: Materials and Applications IV, published by Wiley. 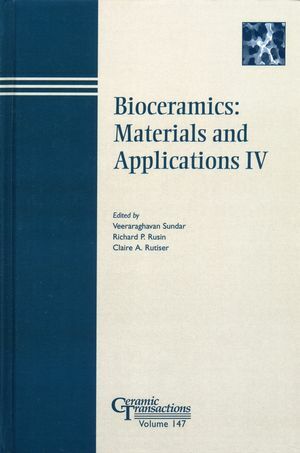 Richard P. Rusin is the editor of Bioceramics: Materials and Applications IV, published by Wiley. Processing and Characterization of Phosphate Bioceramics. Chemistry and Porosity (A. Cuneyt Tas). Biomedical Applications (M. Baccalaro, R. Gadow, and K. von Niessen). Hydrothermal Deposition of Hydroxyapatite Coatings on Glass and Ceramics (H. Pan, M.N. Rahaman, and J.-S. Ha). Porous Hydroxyapatite Containing Silicon Derived from Natural Coral (Y.-H. Kim, S.-R. Kim, S.J. Jung, Y.J. Lee, and H. Song). Electrochemical Deposition and Patterning of Calcium Phosphate Bioceramic Coating (K. Duan, Y. Fan, and R. Wang). Oxide Based Sintering Additives for HAp Ceramics (S. Kalita, S. Bose, A. Bandyopadhyay, and H.L. Hosick). Synthesis, Characterization and Sintering Behavior of Calcium Hydroxyapatite Powders with Average Particle Diameters of 150nm (A.C. Sutorik, M.S. Paras, D. Lawrence, A. Kennedy and T. Hinklin). Microstructure of Hydroxyapatite Thick Film (W.-L. Shieh, W.-Y. Huang, and T.-S. Sheu). Molecularly Dispersed Hydroxyapatite Polymer Nanocomposites (O.C. Wilson Jr., and L. Marshall). Interactions between Ceramics and Biological Environments. Effects of Organic Molecules In Kokubo¿s Simulated Body Fluid on Apatite Formation on Bioactive Glass and Titanium Substrates (K. Tsuru, Y. Higashi, S. Hayakawa, and A. Osaka). Hydroxy-Carbonate Apatite Synthesis, Blood Compatibility and Adsorption of Specific Pathogenic Proteins (S. Hayakawa, Y. Kusudo, S. Takemoto, K. Tsusru, A. Osaka, and S. Takashima). In Vitro Stability Predictions of Osteoblast Interaction with Hydroxyapatite and β-Tricalcium Phosphate (I.O. Smith, M.K. Soto, M.J. Baumann, and L. McCabe). Two and 10 Year Retrievals of Zirconia Femoral Heads: XRD, SEM and Raman Sprctroscopy Studies (D.D. Green, G. Pezzotti, S. Sakakura, M. Ries and I.C. Clarke). Phase Transformation and Residual Stresses In Retrieved Zirconia Hip Implants - A Raman Microprobe Spectroscopy Study (G. Pezzotti, S. Sakakura, A. Porporatti, D.D. Green, I.C. Clarke, and N. Sugano). BioLubrication Phenomena (Protiens) May Control the Wear - Perfromance of Zirconia Hip Joints (I.C. Clarke, D.D. Green, G. Pezzotti, S. Sakakura and B. Ben-Nissan).